I have now been to Grown a number of times, and it is always a lovely experience. Often when I have gone, it has just happened to be cold and rainy, and sitting inside sipping a hot drink is delightful. Also, my mum loves this place, specifically their scrambled tofu. So we've been a few times on a Sunday morning (Saturday mornings are very hard to find a park because there are some markets on down the road) to enjoy the menu. You can see some of my other visits to Grown here. I mentioned hot drinks, and Grown has a nice selection. I don't drink coffee, but they have lots of options. 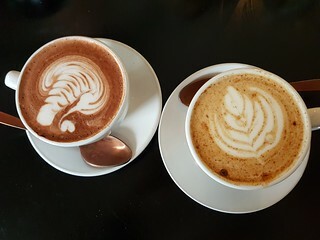 Here is a Dark Hot Chocolate and a Spiced Chai, both on soy milk. The hot chocolate is particularly amazing, and another one of my mum's favourites. 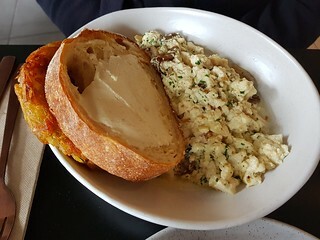 Here is the famed scrambled tofu, which is served with toast and smoked sesame cheese. Also a hash brown added on, because you should always potato. I was curious as what their homemade Vegemite would be, so I ordered toast and Vegemite. It was nice, but not Vegemite. 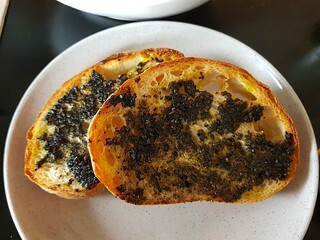 It was some sort of sesame based product again, but didn't have that strong salty flavour that I want from when I am having Vegemite. 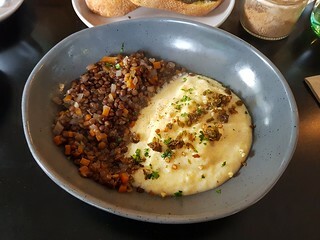 I enjoyed this lovely dish of polenta and braised french lentils. It was warming, and the flavour was lovely. They've recently redone their menu for summer, and sadly this has been taken off. Hopefully they will bring it back at some stage. 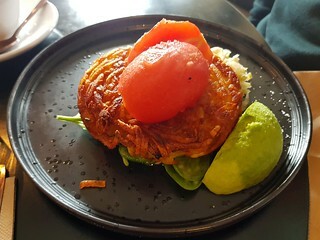 My dad tried the Housemade Hash Brown the one time he has come with us. While they do have the option to add a hash brown as a side to anything, they also make a feature meal of it. It had roasted tomato, avocado, greens, cannellini beans, and capsicum sauce. They have changed the accompaniments slightly in the new menu. While there is a regular toastie on their menu, sometimes they have specials. 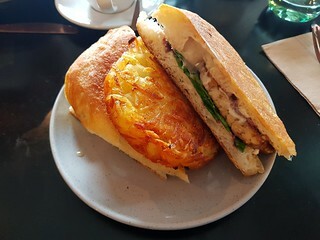 I got this amazing Tempeh Toastie, which had sesame cheese, spinach, caramelised onions, and aioli in it... and I got a hash brown on the side of course! Grown is a lovely place, and I definitely recommend it. I've been a couple of times since these visits as well, and I am hoping to make it back sometime soon for their dinner menu. Dim Sim has been such a good perfect girl with her stitches, she hasn't been bothering them at all. Unfortunately the results came back to say that they couldn't be sure that the tumours were completely removed. So next week she will go back to the clinic, but will have to have a full general anaesthetic to remove more tissue. 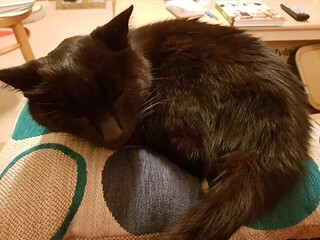 She will also have another lump on the back of her neck removed, and her teeth cleaned up, given that if we are going under we are going to do everything that needs doing. She has the best team of vets looking after her, but I am still a very worried mum. I'm so interested in this sesame cheese I always read about on your blog! All the meals look amazing, that polenta looks so creamy. I've never been able to achieve that level of creaminess! And I want all of those hash browns please! I am sending all my positive energy to Dim Sim. And my girls are too!!! She is so gorgeous and shiny! It seems like sesame cheese is a local phenomenon! I'm glad we have it, it is so good. Also glad to inspire you for cooler weather as our weather is heating up. That is a lot of beautiful food! I love hot chocolate. I've never paired lentils with polenta but thinking about it, I imagine it would be pretty amazing. It is a pretty great combination. Tempeh doesn't get enough love as a toastie ingredient.